This story comes from pages 144-9 of the Japanese book Yokaren no gunzou: Moto shōnen kōkūhei no kiroku (Yokaren group: Record of former Navy youth pilots) edited by Ōita-ken Yūhikai and published in 1995 by Kiichi Kawano, Director of the Yokaren Museum in Ōita City. The first section of this story contains an article published in a local newspaper. The final section gives Toshio Ōta's account of the day he spent with a friend on leave from the shinyō explosive motorboat base in Genkai Town, Saga Prefecture. Right before the end of the war there was a base at Genkai Bay in Genkai Town, Higashi Matsuura-gun. The members of the Navy's 118th Shinyō Special Attack Squadron (Kageyama Squadron) gathered at this memorable place for the first time after the end of the war on Sunday, May 27, 1984. For the first time in 39 years, they met again the people of the town's Chikagawachi Area who took care of them during the war. Shinyō was a two-man boat constructed of plywood. It was a tokkō (special attack) boat, loaded in front with explosives, for use in taiatari (body-crashing) attacks against enemy ships. The Kageyama Squadron made base in April 1945 at an inner inlet of Genkai Bay. The boat pilots were Yokaren (Preparatory Flight Training Program) graduates from Mie Naval Air Group, and the ground crew were from all over the country. A total of 189 men were part of the squadron. They worked hard in training as they lodged in stone-cut huts, but the end of the war soon arrived. It was a short period of time, but they developed deep relations with the people of the Chikagawachi Area. Each night they were invited to take hot baths, and they helped out cutting wheat and planting rice. During the previous year in September, the Yokaren National Association held a meeting in Takarazuka City, Hyōgo Prefecture. The story of the Kageyama Squadron came up, and there was a great deal to talk about. Fortunately, the register of squadron members remained, and they heard from 80 persons. From all over the country, from Hokkaidō to Okinawa, 40 persons visited this memorable place. Many squadron members were also accompanied by their wives. After erecting a wooden post at the site of the base, they met again the local people at the Chikagawachi Kominkan (Community Center). As might be expected of the place where they passed their youths in the face of death, scenes were observed where they wiped away tears at reminiscences. Toshio Ōta (56), who was the youngest in those days at 17 years old, became deeply emotional when he saw the rice sprouts, being just the right season during his visit. He said that during the war he helped plant rice. He left with the promise that when he came again he would take as presents some of the wonderful sweet potato mochi (rice cakes) made by the housewives of the small farming village of 55 houses. 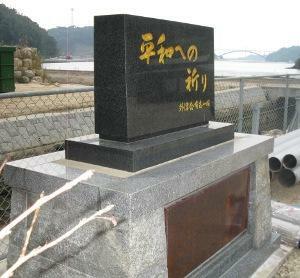 Former members of the Navy's 118th Shinyō Special Attack Squadron who were at the base at Genkai Bay in Genkai Town, Saga Prefecture, erected the "Prayer Toward Peace" Monument at the base site. On May 24, 1985, an unveiling ceremony took place together with the residents of Chikagawachi who they knew during the war. The war ended soon after construction of the base, but during that time the squadron members developed close relations with the residents of the Chikagawachi area. Last year they renewed their acquaintances with former squadron members, who then said they would soon erect a monument. Genkai Association volunteers, made up of former squadron members, with former squadron commander Shirō Kageyama named as association head, completed and erected a monument that is 1.8 m tall, 2.0 m wide, and 1.0 m thick. About 100 people attended the unveiling ceremony. Besides people from around Kyūshū, association members and family from Tōkyō, Nagoya, Ōsaka, and other cities and people from the Chikagawachi Area went to the ceremony. After the monument engraved with the words "Prayer Toward Peace" was unveiled, a celebration was held. They reminisced about those days they spent there in the face of death forty years ago. From the day I arrived for duty at the base, I was inundated with tasks such as camouflage of boat moorings, preparation of boat tunnels and roads to carry equipment, and training to navigate the sea area where we would sortie. About a month passed in an instant. I was resolved, but there were signs that the sortie would not be today or tomorrow. I got used to life at the base. I think it was the first part of June when I first got permission to leave the base. Squadron members were glad even to go to an elementary school's field day. We would line up single file at the sentry gate and get our leave passes all at once. We left and went toward Yobuko Town from the hill in back of the base. As you know, the shinyō crewmen were young and blessed with physical strength, but in comparison to them, the base workers were nearly all around 40 or 50 years old. I had heard that when you arrived at the entertainment district, crewmen were at the front of the line and base workers were at the very end no matter which line you saw. A friend and I, saying it would be nice to eat some delicious fish, wove our way through the thick woods on the hill at the back of the base. We climbed a steep slope, which was a shortcut, and crossed the top. We arrived at last at a level place. On the roadside something had been placed. Many freshly picked biwa (Japanese loquat) fruit were in a large bamboo basket. They gave off a familiar smell and really whetted our appetite. We looked around thinking that there was a biwa fruit field nearby and farmers probably were picking them. However, it was not at all like this since we could not see far with just a wooded area around us. When we looked closely, we saw a chipped wooden bowl placed next to the bamboo basket. Inside the bowl were prices of so many sen (pennies) for so many pieces that perhaps had been written by an elementary school student. When we two saw that, we finally realized that it was an unattended sales place. We two quickly decided that today we would buy all of the biwa fruit. First we decided how many that would be and started to count the number, but it was difficult to count them individually. We discussed whether it would be OK to compute a rough estimate by taking the number of bunches by the number of biwa per bunch and put that amount of money in the bowl in order to speed up the process. We quickly started to eat, but this again did not go very well at all. We stuffed our mouths, and first it was best to squeeze out only the seed, but next we could not easily separate the pulp and skin inside our mouths. It felt like there were many dregs that remained inside our mouths. Of course we should have peeled the thin skin off one by one. The two of us plopped ourselves down on the ground and ate them at breakneck speed. We ate without even making time to talk with each other. At our feet we made a mountain of biwa seeds and skin. We both felt satisfied when there was still a little left. There was no container for us to take what remained. We two took a big deep breath, looked at each other's face, and burst out laughing. Ah, on we ate, we ate. Since a biwa has a large seed and little pulp in comparison to other fruits, or maybe because of our youth, we were able to eat a lot of them as we shared jokes together. We put money in the bowl, and it was off toward Yobuko Town without any regrets. We walked down the gentle slope and came out near Nagoya Elementary School. An Army noncommissioned officer approached us smiling. He asked us for a cigarette. When I looked, behind him were about ten soldiers who seemed like older conscripts. They probably didn't have any cigarettes. Luckily I did not smoke and thought I could help them out. Since I usually had about 40 Hikari cigarettes, I felt like letting the older men have a smoke and gave them all of my cigarettes. I saw them leave saluting me with toothy smiles and feeling refreshed. When we arrived at Yobuko, on the beach there was a large ryokan (Japanese inn) priding itself on its cuisine. When we visited, the okami (proprietress) said, "We have nothing else, but if it is fish you like." That was just the place I wanted. I was born in the mountains of Ōita Prefecture. Although we ate river fish while growing up, I have no memory of being fed sea fish. I ordered some at the inn. When we came out at the shore and looked, the proprietress told us that preparations were completed. When we entered the room, splendid cuisine of all tai (red sea bream) was brought out. There was also a bottle of beer for each of us. My friend had secretly put that beer inside of his haramaki (stomach band), and it was something special that he had brought. We made toasts with beer high in the air together with the restaurant's proprietress. We divided the small amount or beer and drank together. We heartily tasted the delicious ikizukuri (prepared-alive) tai. Today or tomorrow, our lives might have been gone. That was a deeply memorable day when we hungry 17-year-old youths could to our heart's content savor a sense of satisfaction from this life. This was the only day that I had to take leave while at the base. Every day as we waited to sortie we spent all of our time engaged in activities such as inspection and maintenance of boats and coastal navigation training. That day out was a dose of tonic during this time. Kiichi Kawano kindly granted permission for translation and publication of this story.